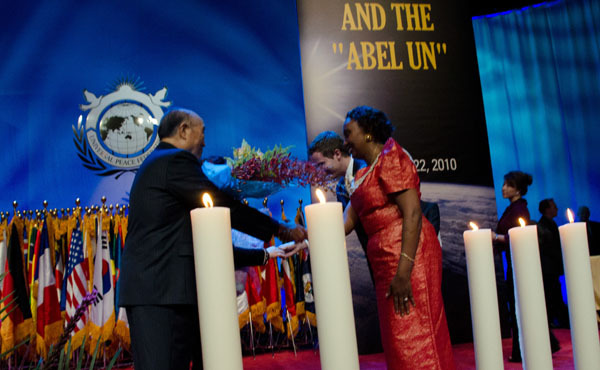 New York, USA - Despite the sudden outbreak of renewed hostilities between the two Koreas, UPF Founder Rev. 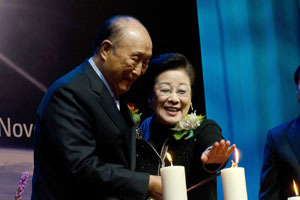 Dr. Sun Myung Moon has reiterated his firm belief that a new era of lasting peace is close at hand. 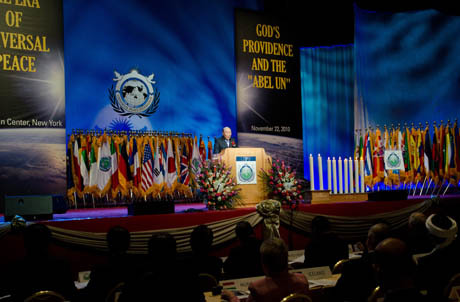 His confident prediction came at the conclusion of the UPF World Assembly 2010, which drew a crowd of over 3,000 at the Manhattan Center in New York on November 22. Back in April, when the South Korean navy ship Cheonan was sunk by an alleged North Korean torpedo attack, Rev. Moon called for restraint in a tour of major Korean cities, and held special memorial services for the 46 South Korean sailors killed in that attack. 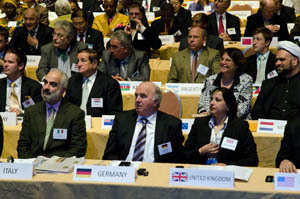 More than 30 Ambassadors and diplomatic representatives from the United Nations and from embassies in Washington DC were in attendance. “I believe the principles we heard tonight could help our nation, and I want to invite the UPF to come and hold a leadership program,” said. H.E. Dr. Mory Kaba, Ambssador of Guinea to the US. 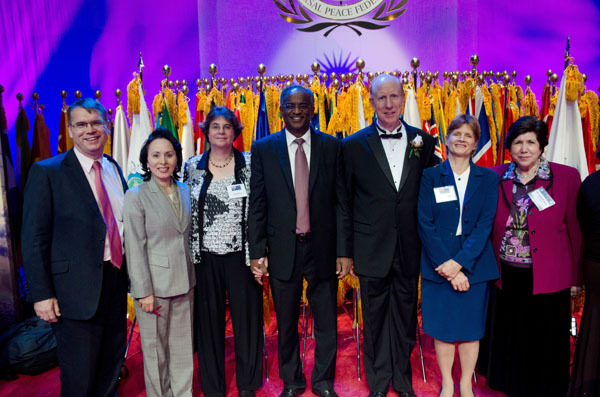 “We should all become Ambassadors of Peace,” said Dr. Mahamoud Adam Bechir, Ambassador of Chad to the US. Rev. 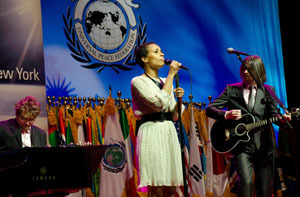 In Jin Moon, Senior Pastor of the Unification Church of America, opened the program by urging those gathered to become the new “peace generation” the world needs. Georgia State Senator Donzella James called for a return to traditional values and affirmed UPF’s commitment to marriage and family. 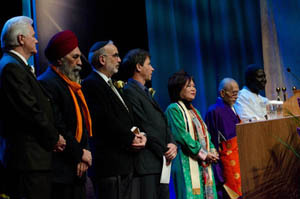 Dr. Hyung Jin Moon, who serves as the UPF International Chairman, spoke not only of the need for interfaith dialogue and cooperation, but insisted that spiritual values must serve as the foundation for good governance and harmonious international relations, referring to his father’s call for an interfaith council at the UN. The evening also featured interfaith prayers and the lighting of peace candles by representatives of seven major world religions, and an uplifting musical interlude from the Lovin’ Life Band. Ambassador Anwarul Chowdhury, the former UN Under-Secretary-General who served two terms as President of the UN Security Council, applauded the UPF’s vision of UN renewal. “Tonight’s gathering, with representatives of more than 190 nations seated in conference, supported by the prayers of religious leaders of every major faith and watched over by thousands of observers, is truly a model of what a Peace UN could be,” he said. Amb. Chowdhury promotes the Culture of Peace and has been urging effective implementation of the International Decade for the Culture of Peace. With national representatives seated in alphabetical order, delegates from neighboring East African nations of Ethiopia and Eritrea found themselves side by side. For three decades Eritrea fought Ethiopia for its independence, which was finally recognized in 1993. The two men made plans for joint cultural programs to build better understanding and goodwill between their nations.